I've copied and pasted this old post from my Canvas Community blog in order to reference it here. In my first posts in this series I gave an overview of my rejection of punitive "bad" grades and also my rejection of so-called "good" grades. In this post, I will provide an overview of my solution to these problems, where I give my students feedback about their work, but they do the grading. I sometimes call this approach "all-feedback-no-grading" because, from my perspective, that is how it works: I give lots of feedback, but I never put a grade on anything. Students decide what grade they will get, not assignment by assignment but through their overall work in the class. Again, this is just an overview, and I'll get more specific in later posts. Meanwhile, please feel free to ask questions, and that will help me know what to address in those future posts! I've been using this system for so long now (over 15 years) that it is totally familiar to me, and it's sometimes hard to gauge just what is self-explanatory and what actually needs explaining. I use microassignments in my classes. 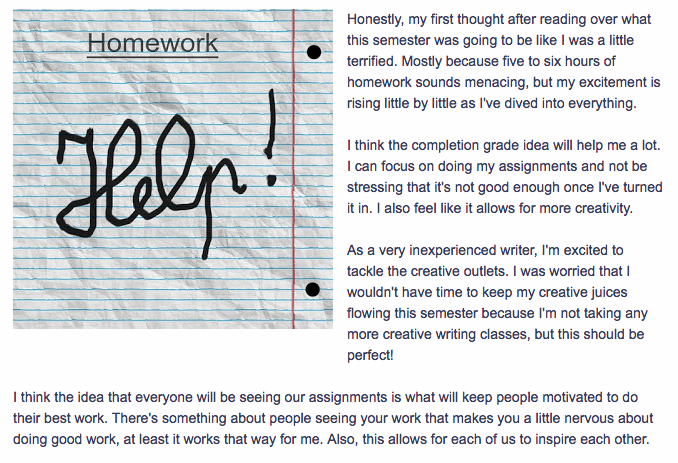 I made up the term microassignment to convey the idea that there are no big, high-stakes assignments of any kind. Some of these little assignments take just 10 or 15 minutes to complete; others might take as much as an hour, but not more than an hour — unless, of course, the student gets excited and wants to spend more time; sometimes they do, especially when they are working on their class project. I advise students to budget a total of 5-6 hours to spend on my class each week; how they schedule that time is totally up to them. 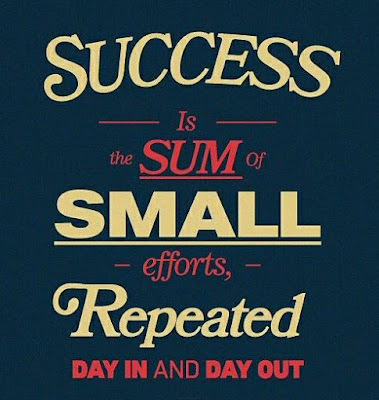 Because the assignments are small, students can work on them in short snatches of time, or they can sit down and complete several assignments in a longer study session; it's all up to them. I love teaching online for just that reason: I am glad to take advantage of any time the students can find for this class. As students complete each microassignment, they record the completed assignment in the Gradebook using a "Gradebook Declaration," which is actually just a true-false quiz. The quiz contains a checklist of all the requirements for the assignment to be complete, which is more or less detailed depending on how complex the assignment is. The Declaration checklists are also a good reminder to them about exactly what they need to have done for the assignment to be complete. Students answer "true" to indicate the assignment is complete and, presto, the points go into the Gradebook. There is no partial credit; students get credit for completed assignments only. If they start an assignment, but do not have time to finish it, they can finish it the next week; everything rolls forward that way, so no work is lost. The students do all this grade-work themselves. As they complete each and every assignment, they do a Gradebook Declaration. They find it a little strange at first, but they quickly get used to it. Admittedly, getting the students to slow down and read the Declaration sometimes takes a little work on my part at first; a few students start out treating the checklists as a kind of terms-of-service which they agree to without reading, but when I follow up with them about that, there are no further problems. Because every assignment leaves a digital trail at their blog or at their website, there is clear accountability. They know that; I know that. During the Orientation week, I watch all the blog posts carefully to make sure students understand how the system works. Week 3: Myth-Folklore and Indian Epics. As you can see there, each week has six "core" assignments which provide a week-long workflow: two reading assignments, a storytelling assignment based on the reading, blog commenting on other students' stories, a semester-long project, plus feedback on other students' projects. Most students complete most of the core assignments. Those assignments add up to a total of 30 points each week. In addition there are eight "extra" assignments, and those add up to 20 points each week. Students can use those to make up any of the core assignments they missed. They can do extra assignments if they want to do more of something (more reading, more commenting, more technology, etc.). Students can also use the extra assignments as a way to accumulate points if they want/need to finish the class early. It's all good. So, there are 50 possible points each week, but there is no expectation that students would do all that work. The idea is that they CHOOSE what assignments to do. They can focus on the core assignments and only on the core if they want, or they can mix in extra assignments. They can also work ahead if they want. It's all up to them. I've been using this system, largely unchanged, since I started teaching online in 2002. The reason I haven't changed it much is exactly because of that student feedback: it works. Students like it. Students REALLY like it. And they like it for the reasons that are important to me: they feel in control of their grade, they are not stressed, it encourages them to be creative and learn a lot. 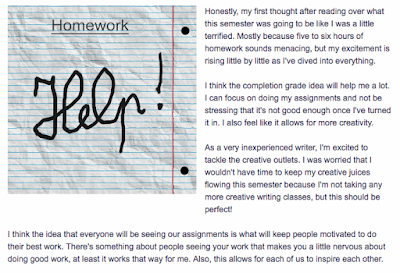 And since some of my students have started already for Spring 2019 (flexible schedule also means starting early if they want), I will share this screenshot of a blog post that popped up literally just a few minutes ago. I think this says it all; one of the Orientation Week assignments is for the students to let me know if this all makes sense and what they think. Here's what one of the students is thinking right now, at this moment. And it sounds good to me! This student understands not just how the course works but why it is set up this way, and I am excited to see what she will do with the reading and writing as she moves on to Week 2, and I'll see how that goes right there in her blog.